An all-time favorite...Our award-winning Miss Grace Lemon Cake has gained legendary status from Pennsylvania Avenue to Hollywood. Each cake is handmade using fresh squeezed California lemons and fresh-grated zest, then hand-dipped in our secret formula lemon glaze to give it the moist and delicious taste that has made it a true sensation. 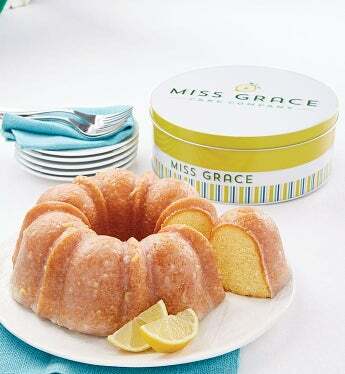 Each cake is carefully packaged and delivered in our classic Miss Grace gift tin. 10-12 servings. Kosher, OU D.
An all-time favorite...Our award-winning Miss Grace Lemon Cake has gained legendary status from Pennsylvania Avenue to Hollywood.Kosher, OU D.